What are good shark sites for underwater photographers? Not so long ago good pictures of sharks were scarce. 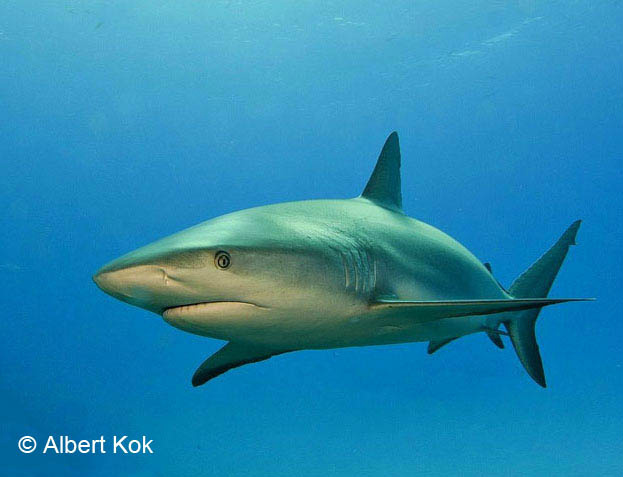 Books that were written on the behavior and anatomy of sharks did not use pictures of living sharks, but dead sharks. One example is the excellent book "Sharks of Arabia' by Dr. John E. Randall (1986). Another example is 'Book of Sharks' (1983) by Richard Ellis who used paintings of sharks. Some years later when better underwater camera's came on the market, the scene changed. A first sign was the book 'Shark. A photographer's story' by Jeremy Stafford-Deitsch. His book from 1987 was one of the first that contained the author's own pictures of living sharks in action. The real 'break through' in shark photography however came about 10-15 years later. This was triggered not only by the advent of superb wide angle lenses and digital UW camera's. Another factor was the increase of diving sites where large predator sharks could be approached from close distance. And when the visitors of these sites published their stunning pictures over the world via Internet, they concomitantly set a new standard for shark UW photography. A good example are the pictures in the Wetpixel Quarterly series published around 2007/2008. I here mention some factors that may determine the quality of such a site and therefore offer good opportunities for making a nice shark picture. - a place that uses a bait to attract sharks, without overdoing the baiting. Baiting should interfere minimally with the sharks natural behavior pattern. Small pieces of bait are often sufficient to attract all kind of sharks. The sharks will then remain calm, and not turn into a frenzy to compete for pieces of bait. A relaxed shark makes a better model. -clear blue water, with little current or waves and a shallow sandy floor to rest on. Or a drift dive with a boat following the divers in a flat sea, for encounters with more pelagic sharks. - dives with not too many divers on the boat. Driven by the idea to make nice pictures of these ‘majestic predators‘, rather than by slogans like ‘adrenaline pumping, heart jumping experience’ used by some tour operators. -a place where sharks come really close, allowing you to use a fish-eye lenses like the Tokina 10-17 (cropped format), 15/16 mm (full frame format) or 8mm lens (4/3 format). A rectilinear zoom lens will also do, especially when sharks keep a larger distance (say several meters). Taking this into account, I’d recommend the following places, in the right season and without mentioning the operators. -Tiger beach Bahamas; Tiger, Lemon and Carribean sharks (thanks to the pioneering work of James R. Abernethy). -Bimini Bahamas; Bull and Great Hammerhead sharks. -Isla Guadalupe; GW sharks, cage diving. -Southern Red Sea; Oceanic sharks (no baiting). Of course this is a very limited list. I did not mention some other ‘hot’ sites; like Fiji, Cocos islands, Galapagos islands, Lemon Drop Jupiter Florida, Shark adventure. Plenty of nice and big sharks. But not my personal preference. Meaning either (or) : too deep, large distance, much current, adrenaline, ad lib baiting. For the same reason I did not mention the sites for meeting large plankton feeding sharks such as Whale sharks (Yucatan, Islas Mujeres, Mexico, mostly snorkeling), and Basking sharks (Ireland, Scotland, SW England).